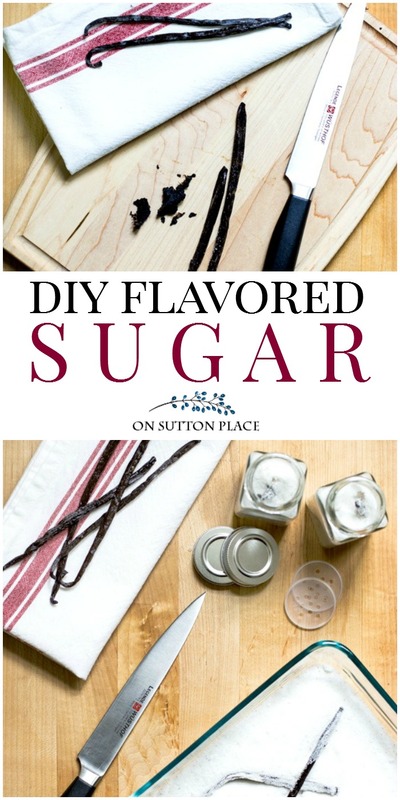 Make these DIY Flavored Sugar Recipes for holiday gift giving. Includes recipes for vanilla and cinnamon sugar. Use in drinks and recipes. One of my favorite things to add to a homemade gift basket is cinnamon or vanilla sugar. Both DIY flavored sugar recipes are super easy to make and when packaged in a shaker bottle, add a custom touch to your gift. Read on for simple tips and directions. *Some links lead to websites where I am an affiliate. Click HERE for my complete disclosure. Pour into glass shaker jars using a funnel, and add a vanilla bean to each jar. You may have to cut the beans in half to fit inside the jar. OR pour all the sugar into an airtight container and use for baking. Make sure to add a vanilla bean or two to the container. 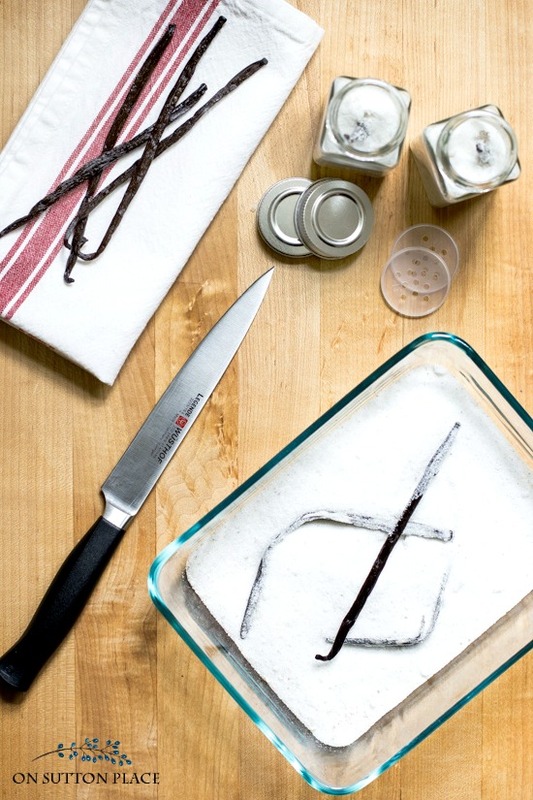 Vanilla beans can be found at specialty grocery stores, spice stores or online. They are usually marked by a “grade.” Grade A being the best, Grade B being a bit dryer and so on. Grade A vanilla beans are the easiest to scrape so I highly recommend splurging on the higher grade. 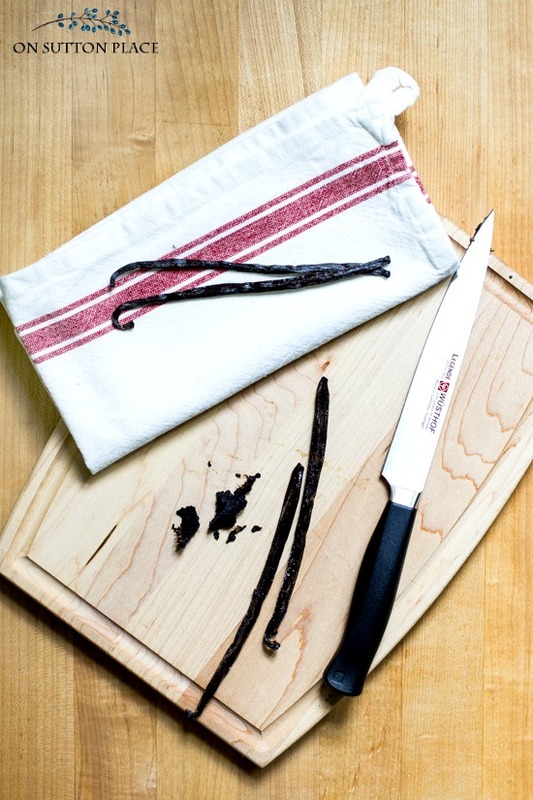 To scrape a vanilla bean pod, place it on a cutting board. With a very sharp knife, slice it down the side. Place a finger on the pod as you slice to hold it firmly in place. Open the pod and scrape the insides with the knife. It will look like a dark, sticky clump. This clump of flavorful goodness is what you will add to your recipes! Whisk sugar and cinnamon together until completely combined. Pour into glass shaker jars using a funnel, and add a cinnamon stick to each jar. You may have to break the sticks in half to fit inside the jar. OR pour all the sugar into an airtight container and use for baking or on buttered toast. Make sure to add a cinnamon stick or two to the container. Click HERE for a printable copy of the recipes. Click HERE for printable tags. Click the arrows to scroll and shop! Thank you, THANK YOU!! I made these and the flavored salt, a big hit. I am so thrilled to have discovered your site, LOVE all your posts, very creative, and helpful, thank you for providing this! You are most welcome…Happy Holidays!